I put a lot of thought into this recipe because I was making it in honour of Remembrance Day. I actually came up with the the idea weeks before hand and though I probably wasn't treading new ground representing Remembrance Day with the red of cranberries and poppy seeds, I was nonetheless excited about it. An added bonus was that these flavours are quite seasonal. I wasn't sure where to start with this one. I looked around for cranberry poppy seed cakes and loafs but wasn't really happy with what I found. Many of them were using proportions I didn't like as well as dried cranberries, which wasn't going to cut it for me. I also looked at lemon poppy seed cakes, but most of the flavouring for those relied on lemon zest. To get the most flavour I wanted something that was going to use cranberry juice as an ingredient. Although it's true that in many cases I could replace milk with cranberry juice, I was wary as to how all the extra acid would effect the finished product. I eventually decided to adapt an orange cranberry bread recipe and add poppy seeds. I'm not a cranberry juice connoisseur by any stretch. I don't really buy it, and I don't really drink it. My knowledge of cranberry juice begins and ends with its medicinal properties of which I learned from TV. So it came as a bit of a shock to me that 100% cranberry juice cannot be found in the juice isle (at least not in my grocery store). There are plenty of cranberry cocktails, cranberry blends, and sweetened cranberry juices but no 100% pure cranberry juice. In situations like this I usually head to the organics isle, which has saved me in the past. And there it was, a fancy one litre glass bottle featuring a fat 12.99 price tag. Surely you jest!? Thirteen bucks?! Maple syrup is cheaper than that. I realize you don't get a lot of juice from a cranberry, but man, forget that. I ended up in another juice section (my grocery store apparently has three) that had a bunch of 100% blends and decided on an 100% apple cranberry juice with no additives. I figured that if I was going to introduce another flavour, apple was the one I wanted. Other than the removal of the orange elements, I altered the amount of sugar and because I felt that brown sugar was a more natural and seasonal pairing with cranberries, made that change as well. I had also planned on tossing the cranberries in a little flour to make sure they didn't sink to the bottom of the pan, but completely forgot. It didn't seem to make a difference. When the finished loaf came out of the oven it was stunning. Perfect! If looks were any indication of flavour, this was a winner. Per usual, I brought it over to my parent's place for Sunday breakfast. After slicing a few pieces and seeing the red of the cranberries, the abundance of poppy seeds, and the soft supple crumb of the loaf, I knew it had to be good. I was right. With no added spices the short list of ingredients really shine. The flavour of the brown sugar worked so nicely with the subtle flavour of the apple and the intensity of the cranberries. But the cake itself was quite sweet, and if not for the balance offered by the tartness of the cranberries, might even be too sweet. Fortunately, the amount of cranberries is enough that you never get that feeling. The texture is exactly as it seemed, soft and moist with the poppy seeds offering a slight crunch throughout. Interestingly enough, it's also a tad crumbly, and though it might seem counter intuitive to say something is soft, moist, and crumbly, that's exactly what it was. I can only assume it's the addition of poppy seeds that make it this way. I put a lot of thought into this recipe and really wanted it to succeed. I wasn't going to serve it to anyone unusual, but because it was my small way of honouring our veterans, I needed it to be perfect (or as close as possible). I'm happy to say that it was. It met and exceeded all my expectations. Everything about this cranberry poppy seed loaf is fantastic and I'm really looking forward to making it again. There really is nothing I would change. Although I would love to try it with pure cranberry juice, its addition would definitely impact the overall flavour. And be careful! 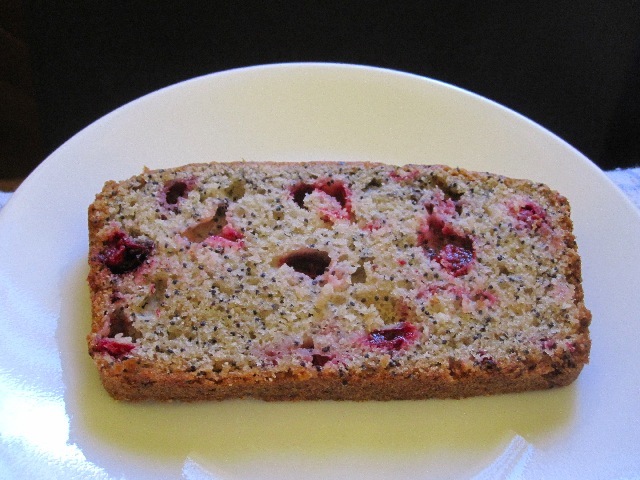 This cranberry poppy seed loaf is good enough that you might eat way more than normal, posing a problem should you go into work and be surprised with a random drug test. We all know how that one turned out for Elaine :). 3/4 cup 100% apple cranberry juice blend – you could also try 100% cranberry or another blend. No additives. Preheat oven to 350F and lightly grease a 9x5” loaf pan. In small bowl add flour, baking powder, baking soda, salt and whisk to combine. In a large bowl add oil and egg and whisk until well combined. Add sugar and whisk until light and fluffy. Add vanilla and whisk until combined. Alternate between adding the dry ingredients and the juice, starting and ending with the dry ingredients and stirring each addition until just combined. 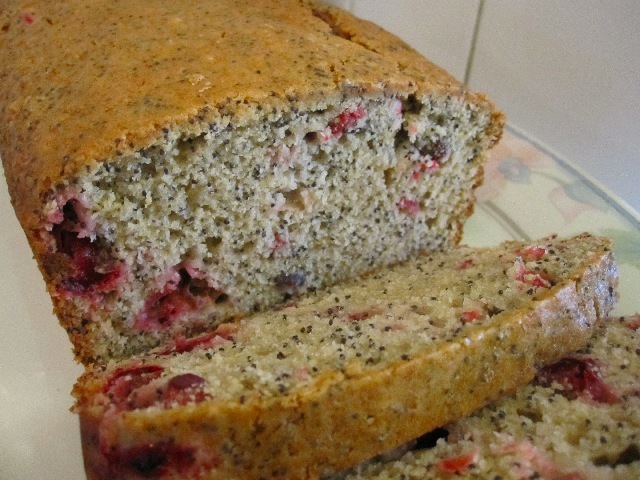 Fold in cranberries and poppy seeds. Pour batter into prepared pan and bake for 50 to 55 minutes or until toothpick comes out clean (this took me 50 minutes). Allow to cool in pan on rack for 10 minutes before removing to cool completely. It does look perfect--truly extraordinary loaf! I think it's wonderful to create both personal and customs to honor veterans--when I was in the UK, I remember seeing men offering cloth poppies you could pin on your shirt, in exchange for a donation for a fund used to help veterans. It struck me how, in the US, for all of our patriotism, we don't have an indelible image like the red poppy to honor veterans. There is also a national moment of silence for the fallen in the UK, which I participated in, and which I still remember as very moving. On another note, your search for pure cranberry juice was hilarious--I often have that experience. 'Of course they will have x,' I'll say, only to end up in the health food section shaking my head at a tiny packet that costs as much as half my grocery bill. Thanks Mary! :) And sorry I mean to respond to this sooner but it has been a rough week. Our poppies look a little different than the British ones, ours are a little less extravagant :), but our tradition is the same, as well as the one to two minutes of silence. And you're right about it being moving. Something about being in a large group of people you don't know, all quiet, all focussing on the same thing at the same time.